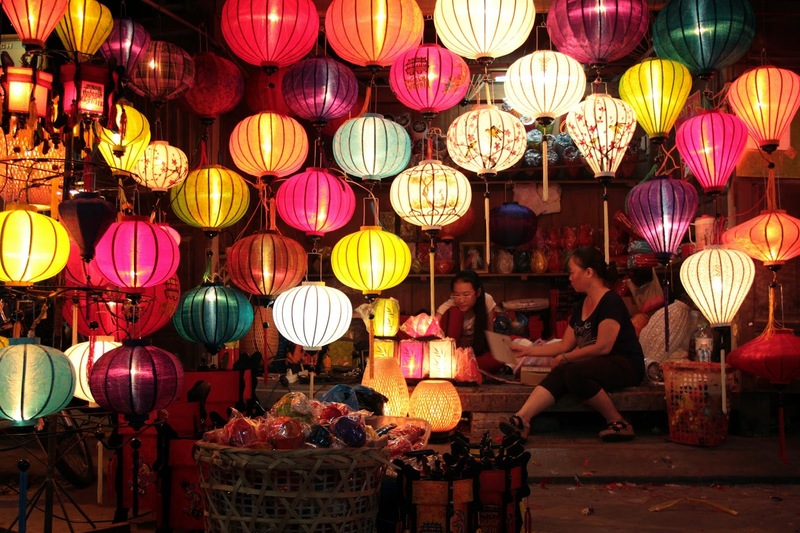 Hoi An has been widely known as the land of several delicious cuisine, namely Cao Lau, fried wontn, clear shrimp & pork dumpling, vermicelli and especially Quang noodle, aka Mi Quang. 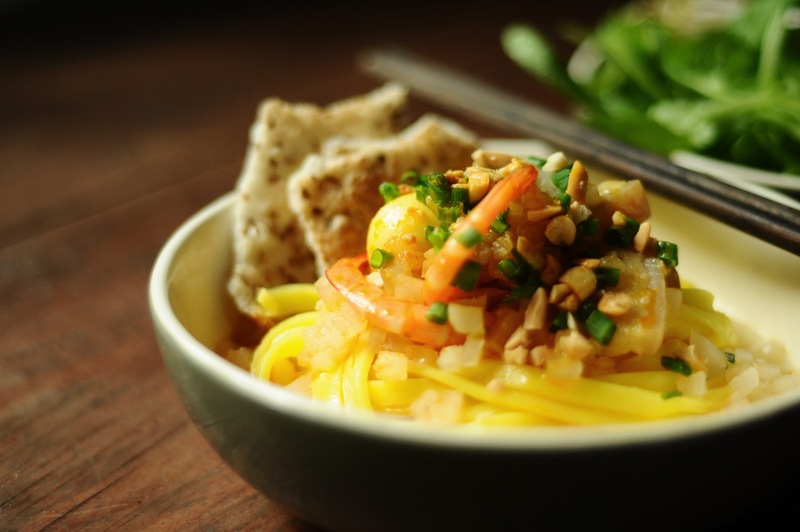 Quang noodle has been tempting to Vietnamese for more than 500 years and included in the local-food list of travelers to Hoi An nowadays. What makes the dish worth trying? The following will reveal the secret attraction of Quang noodle. The origination of this delicious cuisine can be figured out from its name. Quang is the short form of Quang Nam, a peaceful province close to Hoi An, in the central of Vietnam. Quang noodle has four indispensable components including the local noodle, meat, broth (sauce) and herb. The noodle used in this cuisine are completely different from Pho, Mi and Hu Tieu despite similarly made from rice flour. The mixture of rice flour, water and added ingredients was ladled and spread over the cloth stretched over a pot of boiling water, like the process of making rice papers but the sheet is much thicker. Then the rice sheet is taken out to be cooled down gradually and cut by hand into strands as thick as 1cm. 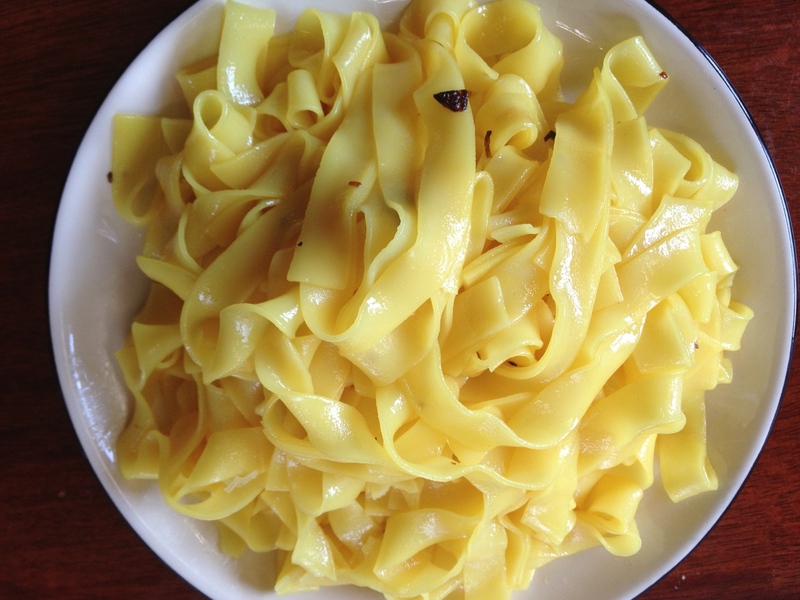 Traditionally, peanut oil is used to separate these sticky strands of noodle. The sauce is poured to half of the noodle bowl, just enough to make strands wet on mixed. Lastly, peanut and grilled rice papers scattered on the top of the bowl. The mixture of noodle, meats, vegetable and sauce has a balance flavors of sweet and salty. 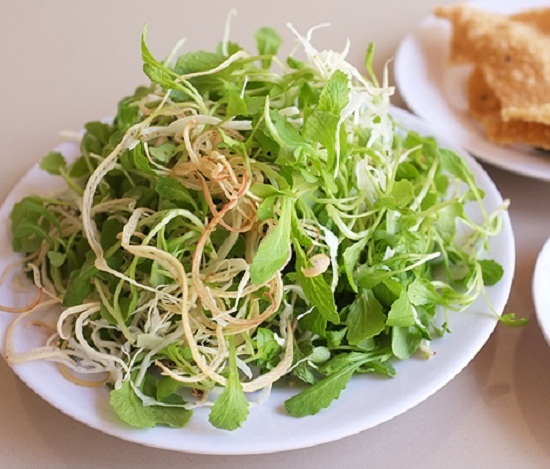 Vegetables included bean-sprouts, mint leaves, water morning-glory, watercress, banana blossom, houttunya and coriander are always served with the bowl of noodle. If one like their bowl to have more intense taste, fish sauce mixed with fresh peppers and garlic can be added. Drinking a cup of tea instead of mineral water after enjoying the dish can make you feel even more enjoyable. The majority of people in Quang Nam like to add spicy flavor to their dish so Quang noodle are hardly appealing without green chili peppers. There is a joke that in the winter, women’s skin look too pale so they add chili peppers to their bowl of Quang noodle to make it hot and spicy. After finishing the dish, they will have lovely pink cheeks, which make them so naturally attractive. It is so interesting to watch a true Quang person to enjoy his dish. He will sit with a bent leg, using his knee instead the table to lay the bowl. His left hand holds the bowl and his right hand holds chopsticks, mixing the noodle then pick up the noodle to his mouth. That is the distinctive style of the local on eating their specialties. After enjoying all the noodle, meat and vegetables and rice papers, there will certainly the remaining of some sauce with peanut or very small piece of meat. In that case, don’t be so shy to leave it, instead you can lift the bowl and finish all. That would make you look more local than ever! So now are you appealed to Quang noodle? Why don’t you have a trip to Hoi An and enjoy this wonderful cuisine?